August is my favorite month in DC. Everyone is on vacation and the City empties out. Granted, there is an influx of tourists but most of them are not driving and looking for parking spaces. The painting pictured here was completed this afternoon and I think I might leave it alone for now. The scene is the corner of 12th and E Streets NW just a block up from Pennsylvania Ave. I had been making my way up Pennsylvania from the National Gallery stopping to sketch along the way and decided to stop and sketch Ollie's Trolley which is a longtime, popular Washington eatery. The scene is a little complicated but I thought the challenge would be fun. This photo is right out of the camera and needs some color adjustment and brightening. The yellow in the photo is too strong as are the purple tones. I'll do more photos tomorrow when the light is bright in the studio. 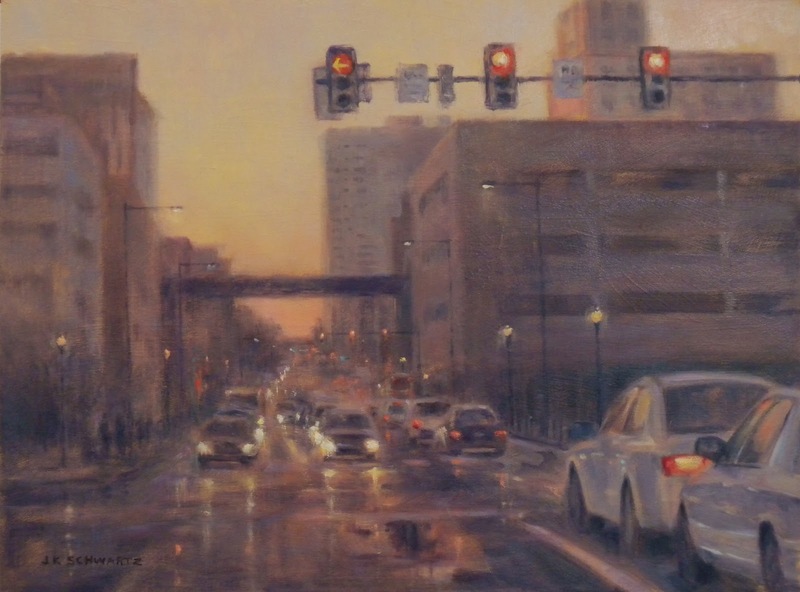 I have already started my next painting which will be of Pennsylvania Ave. after an evening rain. I feel like playing with lights and reflections again. Much fun! I am surprised it has been so long between posts but then I am also surprised with how rapidly this summer is going by. This is one of the loveliest summers I can remember! Odd then that I am not out painting the landscape everyday. Nope, I have been focusing on cities. I have, however, spent some great days in downtown DC with sketchbooks and camera. I will be heading back with my pochade box but doing quick sketches allows me to cover more ground and decide where to head with my easel. 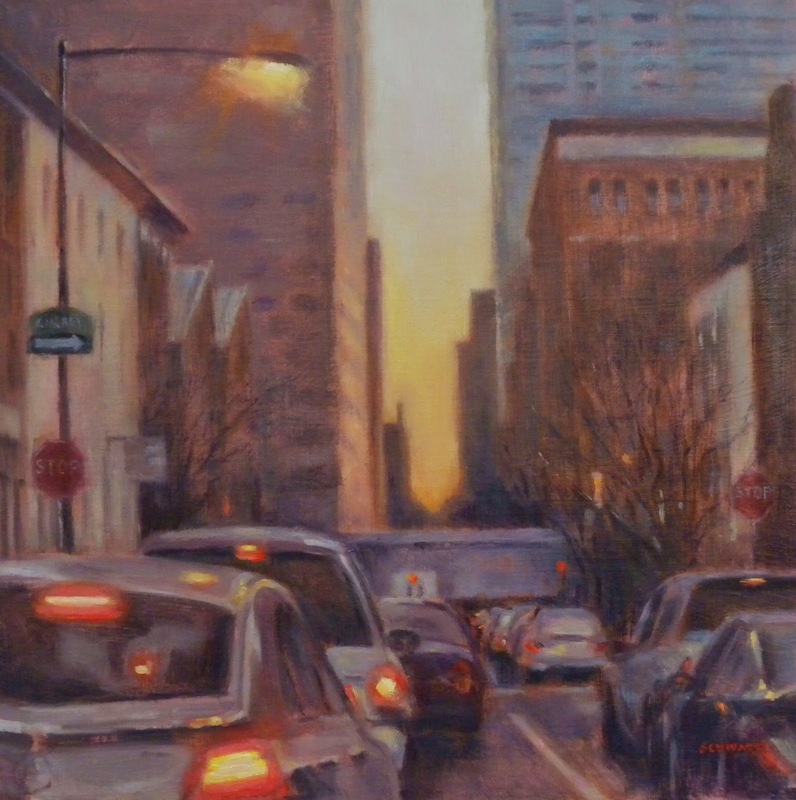 Besides DC, I just completed a trio of paintings based on iPhone photos taken in December while driving out of Philly. My last post was about the first of these. This one is the third in the trilogy. I had trouble uploading the second one but will give it another go at the end of this post. The photo above is straight out of the camera but I was surprised to see my accurate image appear a little more yellow when uploading from. Picasa. In any case, the lighting is a little rosier in the original. I have banished my 15th Street painting as well as the 12th street one that followed. Sometimes you just need to know when it is never going to work and quit! Today. I worked on drawings and a color study for another 12th Street painting. The format is 12 x24 and is a rather complicated view. I hope I can pull it off. Whether I do or not it is still good to be stretching! So here goes another attempt at uploading painting # 2. Ah! There it is :-) Blogger won't allow an enlargement or title. The title is "Rush Hour on 21st Sreet" and it is 12x12 oil on linen panel.